The Evergreen Chapter, having fun all year long! 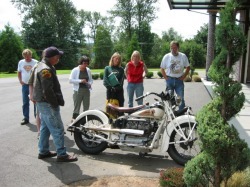 Got a passion for antique motorcycles? Want a place to go for help on a restoration or repair? Want to ride with others who think like you? Do you like riding the backroads of the beautiful Pacific Northwest? Then download and submit one or both of the membership applications and join the Fun! Remember, you must be a National AMCA member to join a chapter. Thanks for your support!